The Wee Glasshouse is a modern, studio apartment in the picturesque coastal location of Dalgety Bay. 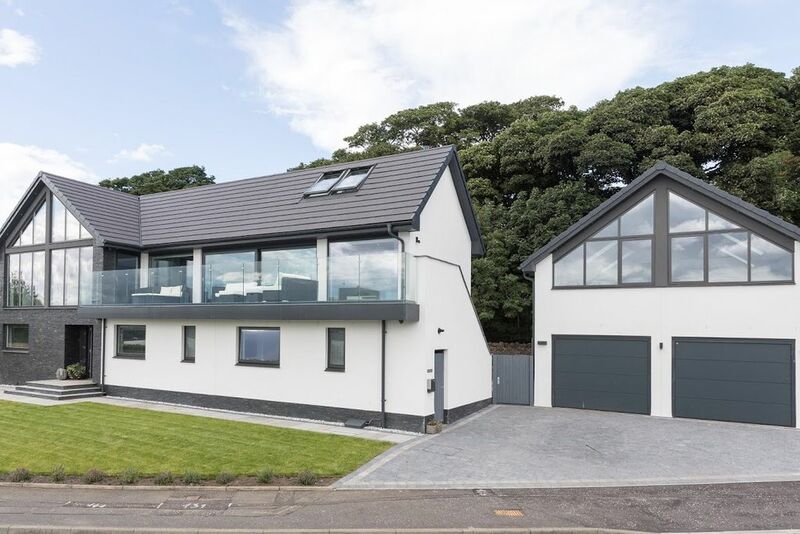 It has been designed to enjoy breathtaking views of the bridges and is situated on the Fife Coastal Path with its many beaches and woodlands. The Wee Glasshouse has certain features similar to our own house which was filmed for More 4’s ‘Building The Dream’. TV Presenter Charlie Luxton visited several times to record it’s progress with the programme being aired in Jan 2017. The studio apartment comprises of hallway leading to a bathroom with double shower. The staircase takes you to the open plan living area with double bed, kitchen, lounge area with double sofa bed and dining table. The apartment benefits from underfloor heating and triple glazed windows throughout, an alarm system, LED feature lighting, remote controlled Velux windows with blackout blinds, bluetooth music systems, WiFi and TV. The kitchen area is fully fitted and equipped for your stay with use of fridge/freezer, hob, oven, microwave, and dishwasher. You will have full access to all of the living areas within the apartment as well as having your own private path around the property to your front door. A free parking space is available to the right hand side of the drive as you are looking at the property from the street. Alan, now retired, has over 15 years experience in Hospitality Management including a position of Night Manager at the famous 5 star resort, Gleneagles Hotel. Throughout your stay there will always be someone you can contact in person at the property or by phone. The Wee Glasshouse is situated in a quiet coastal location with uninterrupted views of the Firth of Forth, Forth Bridges and Queensferry Crossing. It is located along the Fife Coastal Path and is ideally situated to explore the local area and other main tourist attractions. A few suggestions of places to visit may include Edinburgh, St Andrews, Glasgow, The Trossachs, Dundee, Stirling and Perth which are all within an hours drive. The nearest bus stop is 3 minutes walk from the property and a regular bus service operates with links to Edinburgh, St Andrews, Dundee, Dunfermline and Ferrytoll Park and Ride. The Park and Ride is a 10 minute bus journey away which then links in to bus services which travel all over Scotland and Edinburgh Airport. Dalgety Bay Halt (Train Station) is a 15 minute walk away and train services will take you to Edinburgh or up the Fife Coast as far as Dundee. Edinburgh Airport is a 20 minute drive away and can also be reached by taxi or the Jet 747 airport bus to Ferrytoll Park and Ride.